A long time ago (around 13 years to be precise) in a galaxy not so far away, and when Nintendo 64 hardware was still fresh off the factory production line, LucasArts released Shadows of the Empire. Unfortunately for Star Wars fans everywhere, it was a pretty average affair, with only the Battle of Hoth level proving to be truly memorable. 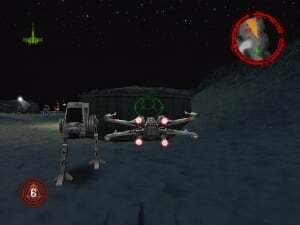 While most of the game took the form of a 3rd-person shooter, one stage allowed the player to take control of a Rebel Alliance Snowspeeder and, in true Star Wars fashion, go for the legs of any AT-ATs which happened to get in the way. Gamers everywhere saw the potential and clamoured for more. Couldn’t LucasArts make an entire game based solely around this type of gameplay? 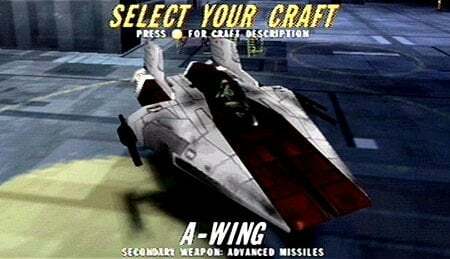 Well, after teaming up with German developer Factor 5, LucasArts decided to make it happen and in late 1998 we were introduced to the first entry of the Star Wars: Rogue Squadron series. Set in the period of time between A New Hope and The Empire Strikes Back, the player assumes the role of Luke Skywalker – leader of the titular Rogue Squadron fleet. The game features all the craft gamers have come to expect from a Star Wars game, from good-old X-Wings and Y-Wings to the more obscure. There are 16 different stages, each with their own mission objectives and set over a wide range of varied environments – from the snow-covered valleys of Fest to the inside of an active volcano on Sullust. If the names of these planets don’t exactly ring a bell, don’t worry; at the time of Rogue Squadron’s development, Lucasfilm was uneasy with video games depicting scenes directly from the movies. 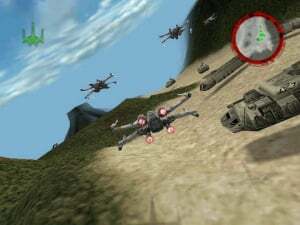 For this reason, the game focuses instead on the expanded Star Wars universe, drawing inspiration from sources such as the X-Wing Rogue Squadron comic book series. The lack of iconic movie locations could be seen by some as a disadvantage, but nothing could be further from the truth. Rogue Squadron, with its original storyline and different range of levels from the usual formula, provides a refreshingly new Star Wars experience. The gameplay is fast-paced arcade-style fun. This isn’t a flight simulator by any stretch of the imagination. However, that’s not a bad thing at all. The tight controls fit the action perfectly; the analogue stick controls the direction of your craft, Z and A slow-down and speed-up respectively and the B trigger is used for standard blaster fire. The C buttons are used for changing camera view as well as ship-specific functions, such as dropping bombs from the Y-Wing or closing the S-foils of the X-Wing. A sign of good game controls is when, after a short while of playing, they become completely natural and you don’t have to think about them. Rogue Squadron is one of those games. No matter how many times you might die (and it’ll probably be a lot), never once will you be left blaming the controls. Rogue Squadron has the distinction of being easy to pick up but very difficult to master. There’s plenty of replay value to be had here. As if playing through the game’s 16 stages wasn’t hard enough, it’s possible to earn bronze, silver or gold medals on each level. Silver and gold medals in particular are very difficult to achieve and it’ll take a lot of practice, play time and replaying levels over and over again to obtain them. Easily frustrated gamers or those looking for a nice game to chill out with should think twice, but for fanatics it provides excellent replay value and a firm sense of achievement when you finally get gold on that level after the 80th try. However, a feeling of pride isn’t the only motivation to go for gold. The developers have included some tantalising unlockables to tempt players to get the most out of the game. Bonus power-ups are also hidden in some levels and finding them will provide upgrades such as shield improvements or more advanced missiles. In addition to the gameplay, another area Factor 5 outdid themselves is the game’s sound. Incredibly, the developers (through the use of advanced compression techniques) have managed to squeeze around 80 minutes of sampled speech and other high-quality sound effects onto the cartridge. The amount of in-game speech coming from your wingmen – while it may seem like nothing nowadays – was amazing back in 1998, and when combined with the terrific cinematic cut-scenes weaved into the missions, it adds greatly to the game’s sense of immersion. The short cinematic sequences, advancing the story at the beginning and end of each mission, combined with the excellent voice acting pull you into the action. Accompanying the game’s quality sampled speech are all the authentic sound effects that gamers have come to expect from Star Wars games. The sound of blaster fire, TIE fighter engines, clanking AT-ATs… chances are that if you’re a Star Wars fan, you’re now hearing these sounds in your head automatically. This is what Star Wars Rogue Squadron sounds like. It’s a tremendously authentic experience and only serves to add to the immersion and overall experience of the game. The in-game music is also worthy of the Star Wars name and includes both familiar and original synthesised tunes. Don’t expect to have the opportunity to appreciate it very often though - due to all the blaster fire and engine noise that will inevitably be wailing out of the TV speakers. The game’s graphics are also of a very high standard for a Nintendo 64 game and make full use of the system’s Expansion Pak. Craft are intricately detailed, right down to their smallest aspects and in-game textures are also a grade above the usual N64 standard. The only downside is that the game tends to suffer quite badly from fogging. Although the draw distance isn’t impressive, it’s hard to fault Factor 5, as this problem riddled many a game on the console. Even still, the fact that most of the environments are shrouded in a heavy fog can’t be ignored. A two-player mode would also have been a nice inclusion, but Rogue Squadron is such an exquisite one-player experience anyway that it isn’t a huge blow. Anyone truly determined to play with a friend should check out the GameCube's Rogue Squadron III: Rebel Strike, which features extensive co-op and versus modes. 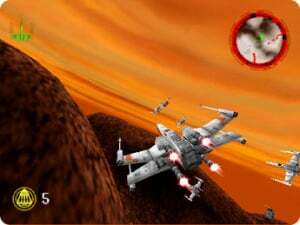 Aside from this, it’s wise to bear in mind that the later stages of Rogue Squadron can be difficult, and if you’re stuck on a level there’s not much else to do but try again to beat it. There aren’t any other game modes to play if you happen to hit a brick wall. What’s more, each time you use up your three lives you have to go all the way back to the title screen and navigate through the menus if you want to try again. That being said, although it’s annoying, it’s only a very minor irritation. Nitpicking aside, it’s hard to shake the feeling that Factor 5 have put a lot of time and care into Rogue Squadron. As well as tons of unlockables (secret passcodes hide even more, should you manage to obtain all gold medals), the iconic Star Wars yellow scrolling text is in there laying out the story. The developers have also included pilot profiles for the prominent members of Rogue Squadron. It’s a nice touch — the sort of thing that no one would notice if it wasn’t there, but they put it in anyway just because they cared. In the same vein, Factor 5 have also included an incredibly detailed cockpit view. It may prove impractical in terms of actually playing the game but it certainly looks impressive and is another example of the developers going the extra mile and putting a lot of effort into something so minor. Even the mission select screen is cool – looking exactly like the holographic-screen from the Yavin base briefing room straight out of the movies. Furthermore, as if Factor 5 would have it any other way, your mission briefing is also delivered to you verbally. 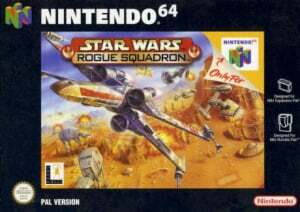 For Star Wars fans especially, Rogue Squadron is absolutely essential. Others just looking for a fun flight combat game will get a kick out of it too, even if they know nothing about the movies. Great gameplay, visuals (minus the fog) and sound combined with an engrossing sense of immersion provides a fantastic experience even a decade later. 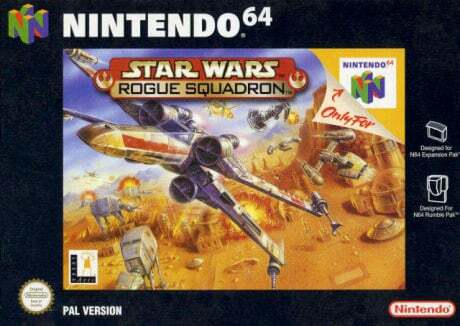 With the recent appearance of the Super Star Wars series on the Virtual Console, let’s hope that Rogue Squadron is next on LucasArts’ list. This game is too hard for me. Glad some enjoy this. I must be the only star wars fan in the world that doesn't care too much about the force, i just cared about flying. I'd probably go 8. Star Fox 64 was much superior. While this was pretty fun it didn't seem to control all that tightly, and ended up being harder than it should've been. And wait till you try the superb GCN versions! Rouge Sqardron is awesome! I hope to see this gem soon on the VC! Big huge fan of this game, just picked it up again actually. Hope this sees a VC release, STAT. i loved this game so much. weren't they releasing a bunch of Star Wars games on virtual console? WHY DIDN'T THEY RELEASE THIS?! Superb review Andrew, I love this series, from N64 to GCN, they are all great. I agree those medals are tough, but all the more rewarding, like a Star Wars gaming Olympics, the Gold is often out of reach. The good ole expansion pak, crammed the detail into this one and it was appreciated back in the day. Good point about the mission select screens too, they were properly cool. Nice one. I love this game. A-Wings are my favorite. i love this game so freaking much! lucas arts, stop wasting your time and get this on that virtual console liek now! PLZ! Yes. The game with one of the most well kept secrets in all gaming history: the Naboo Fighter! I remember playing this a few years ago. Tough, but enjoyable and addicting. @Andrew: You made a typo. It was Rebel Strike, not Rogue Leader, that had multiplayer. loved this game as a kid. i got my 64 in a bundle with this game and pod racer. oh, and very nice review, by the way. great read! 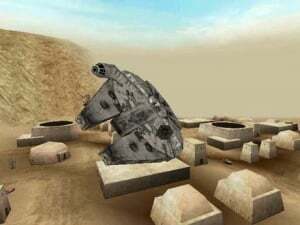 Hopefully we'll see this on the VC at some point, what with all the support its seen from LucasArts lately. Spectacular game for some, but not my cup of tea. So tough. I loved this game but I have to admit that the Cube sequels are WAY WAY better. Those were just amazing. This was such an awesome game. If there are any more Rogue Squadron sequels to be had, I hope they do like this game and focus on the expanded universe. There's two things I would love to have on the Wii, and that's StarFox and Rogue Squadron. This is one of my favorite PC games! I had to downgrade my graphics driver and run a 3rd party patch to get it to work right on my Windows XP computer, but it was worth it. One of the reasons I decided to get a GameCube was because the sequel to this game is a GameCube exclusive. Meh, this game was okay, for an N64 game. I've played better Flight Combat games though. This is one of my most favorite games ever! I still love to play rogue squadron 2 on the gamecube. This better come to VC. This N64 game is actually better looking than many Wii games! Way too hard for little old me, I bought and sold both Gamecube games long ago...I would welcome a Wii-based sequel with adjustable difficulty however! One of the best SW games ever. This game blew me away back in those days. Absolutely impressive. I never found this game to be too hard. hmmm.... Good review. Great game. I remember that this was awesome, and also brutal in some parts. Those dang bombing raids under all that fire?! Does it count as bullet hell if its 3D? Sweet review; takes me back. There are rumours of a Wii remake for 2011. I read in n-gamer that that's a strong rumour. Good revw. I still have the GC version, "no. II"
Hey, what a coincidence, I just read this after playing Rouge Squadron III. Ironic. should i get the game cube one? @ryanknight717 If you like the review to this one, then yes. There aren't as many missions in Rogue Squadron 2, but the gameplay is just as good, and the graphics are really impressive for a GameCube launch title. The gameplay in Rogue Squadron 3 drops some due to the on-foot sequences, but the multiplayer, especially 2 player coop through the Rogue Squadron 2 missions, makes it worth getting as well. @SeanAaron If most of the missions are too hard for you, use the cheat codes. I like to set up 3 profiles for myself: one where I don't use cheats, one where I use all the cheats, and one where I use all the cheats except for infinite lives. One of the greatest games ever! I beat the game 100% percent for the computer, without cheats. This game is beast, i still have it for my Nintendo 64! Long Live N64! I love this game. Along with X-Wing, these series are the best Star Wars games ever made. One of my childhood favorites along with Episode 1: Racer! When will it be released ov VC? This brings back memories. I wonder if it will ever come to vc. this game brings back memories......of not having a controller pak to save. I am so going to get this game!!!!!! It is perfect for me!!!!!!!!!!!!!!!!! I am a star wars fan, and I love plane simulaturs. I also like it challenging, like super mario 64. That brings back good memories........ And thanks to the comments, I found the perfect game for me. Star Wars: rogue squadron!!!! !